Much to Mrs Cook’s disappointment, I’m not very good with my hands, so we’ve come to get some instruction. 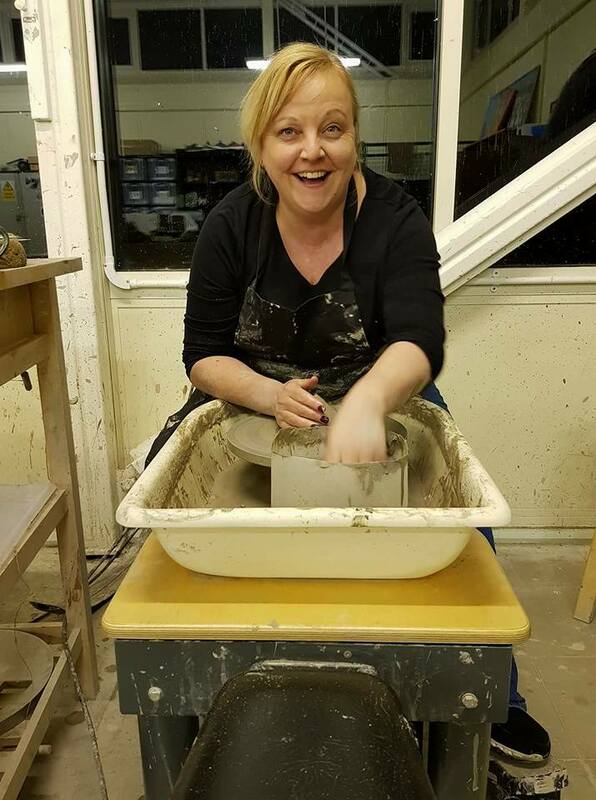 Except this time I’ll also be getting them wet and dirty at a potter’s wheel. The clay chucking instructions are provided, along with tea and coffee, from the lovely Graeme and Inga at Parkwood Pottery. 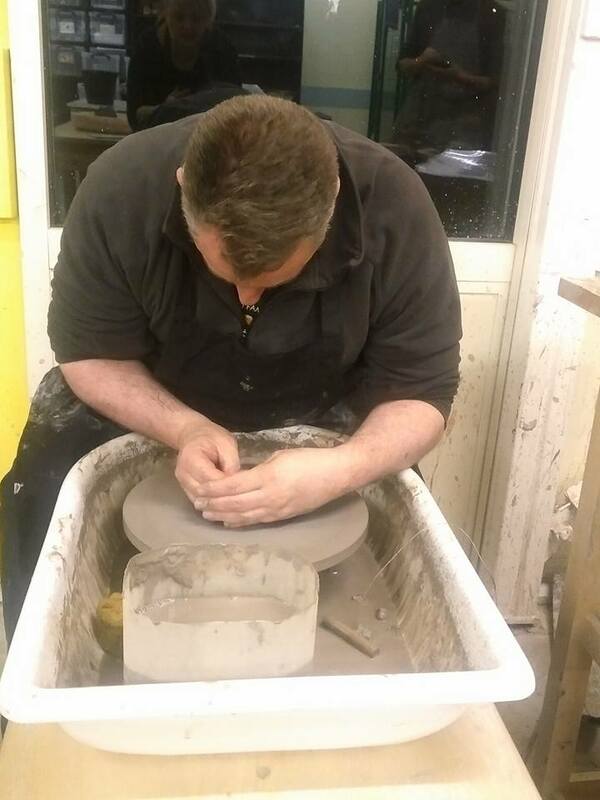 This is not quite the great pottery throw down, it’s a 3 hour taster session for beginners. No, we are not recreating a scene from Ghost. I’m not exactly Patrick Swayzee and she’s not Demi Moore but I am hoping to handle some lovely jugs though its more likely to be love handles in my case. There’s no messing about, and after a quick demonstration its hands on and mucking in, and it does get mucky. With a forceful throw of some moist clay onto the potter’s wheel, we start to centre our clay. I was hoping to model something that vaguely resembled a plate, pitcher or pint, except on my first go I unconsciously managed to make a pot shaped like a phallic symbol. The hands of a master craftsman make this look easy and I was starting to sweat I might not be able to form anything, which would have been a first for Parkwood Pottery. Finally after repeated attempts and interspersed with some instruction on techniques, I managed to make the world smallest flower vase. It is the finest flower vase I have ever made and possibly the best in the whole of creation. Meanwhile, my wife on another Potter’s Wheel makes the perfect razor thin bowl while I barely hold my jealousy. Festooned with a number of tools to work with, I’ve been assured that the sponge on a stick is a diddler, although to me it looks like a roman shufty stick they used to wipe their bums with. This diddler is used to wipe away water and moisture from inside your pot. Same thing I guess. Our 4 pieces to be fired and glazed with Sam’s bowls on the left and my “olive” bowl and plate on the right. 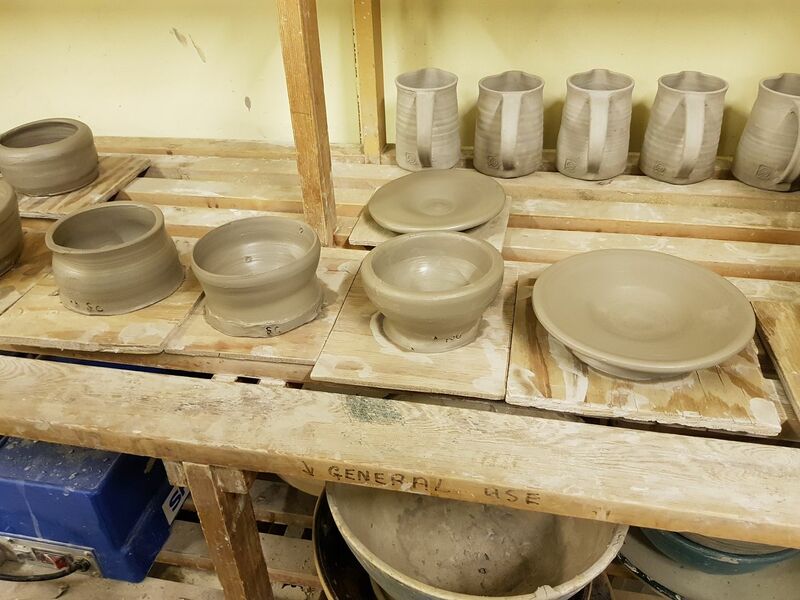 3 hours passed by in a whirl, its quite relaxing, and feeling that triumphant with the latest creations I decide to ditch the finest flower vase in all of creation and settle on having an olive bowl and small salad plate to be fired and glazed while Sam selects her near perfect bowls. If anyone asks, the olive bowl and small salad plate are by design… if you come to the house, you will be served food in these dishes whether you want it or not so you can marvel at the craftmasnhip. We can absolutely recommend a throwdown on a potter’s wheel, it’s £30 and 3 hours well spent.